The notion of the third industrial revolution originated with Jeremy Rifkin, the economist and prolific author of more than 20 books, including his latest The Third Industrial Revolution: How Lateral Power Is Transforming Energy, the Economy, and the World. Rifkin posits that our greatest economic developments arrive when a new form of energy converges with new communications technology. Until the invention of the steam engine in the second half of the 1700s, our work energy was human- and animal-based. It was with the invention of the steam engine that we were able to have machines perform work. Although the printing press enabled printed material to be available for the masses since its invention in 1450, it was only though the combination of the two that we became a literate world with books, newspapers, and magazines in wide distribution. The steam engine and the printing press heralded the first industrial revolution. By all accounts, this combination ushered in capitalism as our new economic model. Mass and transoceanic transportation, mills, early factories, mass agriculture, and new weapons emerged with the steam engine. The powered-printing press acted as the social and cultural container for that new economic era, including materials for public schools. Over a hundred years later, in the early 1900s, electronic forms of communication and oil-powered engines converged in the second industrial revolution. In this revolution, Henry Ford not only introduced the first consumer automobile, but he also ushered in the concept of mass production. Our modern factories emerged from the early automobile assembly lines. In addition, the automobile set a revolution in transportation that has touched every aspect of our lives. Electronic communication also evolved—from the telegraph to telephone, radio, television, microwave, satellite, cellular and digital communications— changing how we interact in all human contexts. Our modern economies and way of life are currently sustained by oil-based energy and materials, and supported by electronic communications. Regardless of our political views, we know that oil-based energy and materials are finite. We also know that its use has severely polluted the planet. We are feeling the limitation of this form of energy as our world population grows and countries, like China and India, need more of it. We are constrained with the energy model from the second industrial revolution and will be more so as we grow to nine billion inhabitants by 2050. Rifkin and others, including the European Union and some global companies, like IBM, envision a third industrial revolution in the near term. In this instance, the energy and communication convergence is between clean renewable energy and pervasive forms of Internet-based communications and applications. Today, technology exists for every household to generate its own form of energy and power up network grids. We also have the technology to replace oil-based ground transportation with electric or bio-fuel vehicles. There is no doubt that we are entering a new era of clean and renewable energy. With the information technology developments of the last 30 years, we also know of the potential to change how we work, relate, and play. The article on the third industrial revolution published in the April 21, 2012, issue of The Economist provides a fascinating forecast for the future of manufacturing. It emphasizes the idea of personalized products delivered through localized factories. Our current manufacturing paradigm centralizes labor and automation, which optimizes costs. China has become the epicenter of this type of manufacturing. In the third industrial revolution, manufacturing would be tailored to the needs of the consumer and deliver highly customized products. Lighter and more affordable automation technology, including 3D printing, would make this possible. One-off items, currently considered cost-prohibitive would become the norm. In this model, factories would be located close to consumers and labor would be minimal due to sophisticated production technologies. According to The Economist article, 3D printing is one of the technologies that will revolutionize how we design, prototype, and, ultimately, make products. It will also change how we use materials. The 3D manufacturing process is additive instead of being subtractive. In today’s manufacturing, we start with large raw materials and extract the parts we need until we get to the finished product. This generates tremendous amount of waste. With 3D printing, the “seed” materials are used in exact proportion to the finished object. This form of manufacturing produces no waste. We are still long ways from owning products made through 3D printing but this is a technology that is gaining popularity in the design and prototyping of products, from shoes to mobile phones. You can already buy jewelry and iPhone cases made with 3D printers. As we contemplate the start of the third industrial revolution, we can’t help but feel hopeful. Everything that is limited and destructive from the second industrial revolution can be transformed. 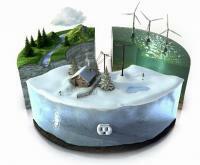 Renewable forms of energy will be within the reach of not only large corporations or governments but everyone. Our communication technologies allow us to connect globally and have democratized the will of everyone with a cell phone. Hosni Mubarak’s ousting in Egypt is a great example of how impactful communication can be in our new way of life. The European Union and, in particular, the United Kingdom, are already acting on the vision of the third industrial revolution by passing legislation and funding programs to prepare for the convergence of clean energy and our Internet-based communications technologies. It seems to me that the U.S. is lagging on this vision and, in particular, we are lagging in education. According to Rifkin and the EU, over 60 percent of jobs in the third industrial revolution will require education beyond high school. Shouldn’t this be our top priority?